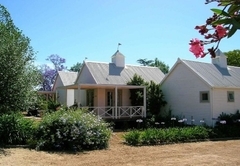 5 Mountains Lodge is a highly recommended Wellington Bed & Breakfast providing accommodation in 5 guest rooms for tourists visiting the Cape Winelands region. 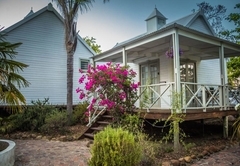 Nestled in the foothills of the historical Bains Kloof Pass, Wellington is known as the heart of the Winelands Region and is a convenient 45 minutes from Cape Town. 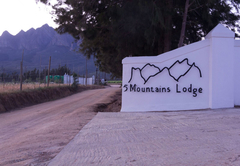 5 Mountains Lodge is a hidden gem of peace and tranquillity, offering bed & breakfast accommodation. 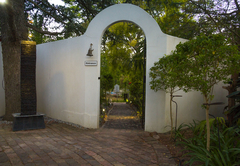 Come and enjoy our beautiful English styled garden, take a relaxing dip in the pool or relax on a sun lounger on the lawns. 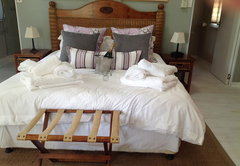 The five individual Garden Cottages are elegantly decorated, each has its own veranda with spectacular views either over the vineyard or the gardens. 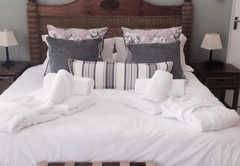 Furnished with a King-size bed, the cottage is ideal for a Honeymoon suite. 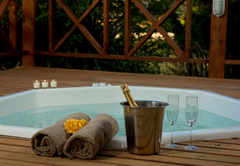 This cottage has its own secluded wood fired hot tub and private veranda with stunning views over the garden. 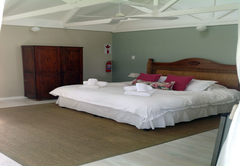 There is a luxurious en-suite bathroom with a roll top bath and walk in shower. 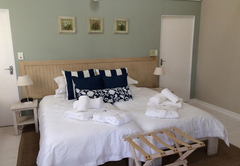 The cottage has two bedrooms. One is furnished with a Queen-size bed and the other has a single bed. The bathroom has a shower only. 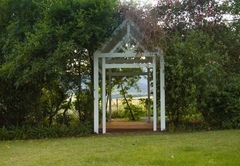 The cottage has a private veranda with views over the garden. 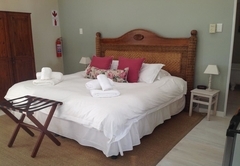 This cottage has two bedrooms; one is furnished with a double or twin beds and the other has a single bed. There is an en-suite bathroom. 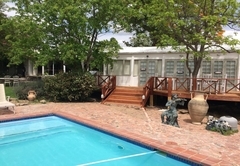 The cottage has a private veranda with views of the vineyard and mountains. 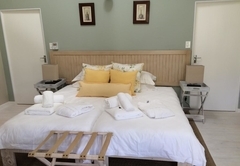 Featuring two bedrooms, the cottage is all on one level making it ideal for those with restricted mobility. 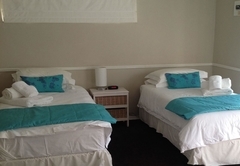 One of the rooms has a double bed (or twin beds) and the other has twin beds. 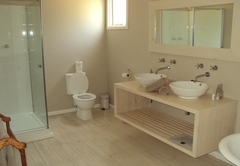 The en-suite bathroom has both a bath and shower. 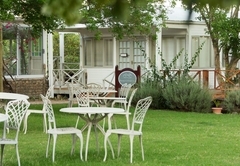 The private verandah boasts views of the vineyard and mountains. 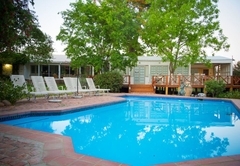 Excellent place to stay, beautiful cottages, gorgeous gardens, and lovely staff. Hazel is the perfect host and makes sure you have everything you need. 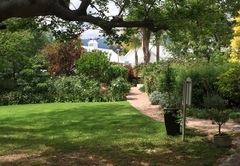 On our first night Hazel booked us in at Oude Wellington vineyard restaurant next door for dinner and it was one of the best dinner experiences I have ever had and I am a real foody the cost of two courses and a very nice bottle of red came to £28. The second night we had a braai brought to our out side deck with everything you need including table cloth crockery and an abundance of meat and salad. Very romantic. 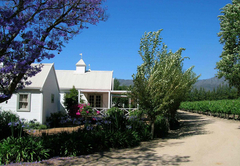 The vineyards are all on your doorstep. 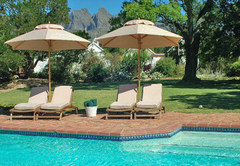 We visited Diemersfontein and Boschendal - absolutely fantastic I would highly recommend 5 mountains lodge. 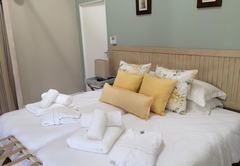 Marcia and Ronelda went for a day spa package which included breakfast and lunch and did we have a really great time! 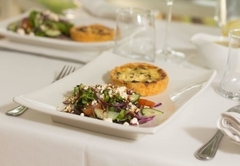 From the get go the service was welcoming and professional. 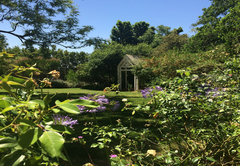 The therapist were calm and so was the ambience and the surroundings. You could not ask for anything more so close to the city and so far away from the hussle and bussle and pollutants. Keep up the excellent service. we will be back with our partners, friends and family! !